"No need for insulated boxes in our high speed unbroken cool chain," says Michael Lodahl at Danske Fiskeauktioner (DFA) in Jutland, Denmark. DFA has invested in 832 Dolav Ace plastic pallet boxes. Made from HDPE, they have solid base and walls. 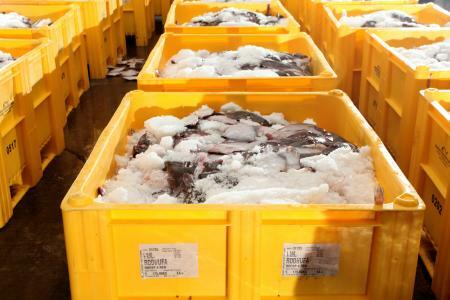 DFA transports between 20 and 200 tonnes of plaice each week, depending on size of catch, in Dolav boxes from its huge cold store sites in Thyborøn, Hvide Sande and Thorsminde to customers in Denmark, Germany and Holland with some 500 kilos in each box. "When the DFA Internet auction is finished we sort the fish into Dolav boxes and export the fish in them mostly for filleting. Danish Fish Auctions is very happy with the Dolav box quality. We don't need the insulation because the high-speed cool chain today is so good and so fast." "The Dolav box lasts us as long as the old insulated boxes and have the advantage that we don't get contamination into the insulation material in the middle of the box wall. If we do have a broken Dolav box it would be very easy to repair before it goes back into production," said Michael Lodahl. Filled Dolavs ready to enter high speed cool chain. At 36.5 kilo tare, about half the weight of same-capacity insulated boxes, the Dolav Ace shows a payload increase of 7-8%. The Ace is also about half the cost of typical insulated boxes and its long service life time can ensure pay back for years. and technology researchers at Campden BRI. Fish by-product from processing is returned to Denmark in DFA's Dolav boxes and used at production sites for pet food and fish meal. 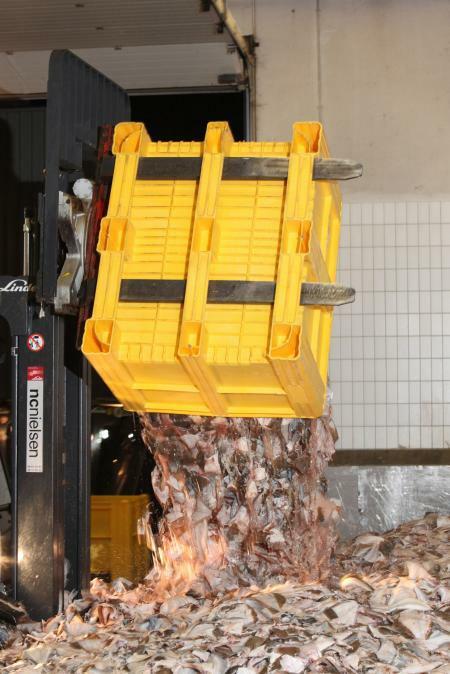 The Dolavs come back and DFA cleans them ready for the next cycle of fish export distribution to Holland and Germany.